My husband and I took a road trip with his brother and sister-in-law and two of their children in July 2012. It was a rescue mission. My in-laws are horse owners. Before our trip, they had three horses and room for more. 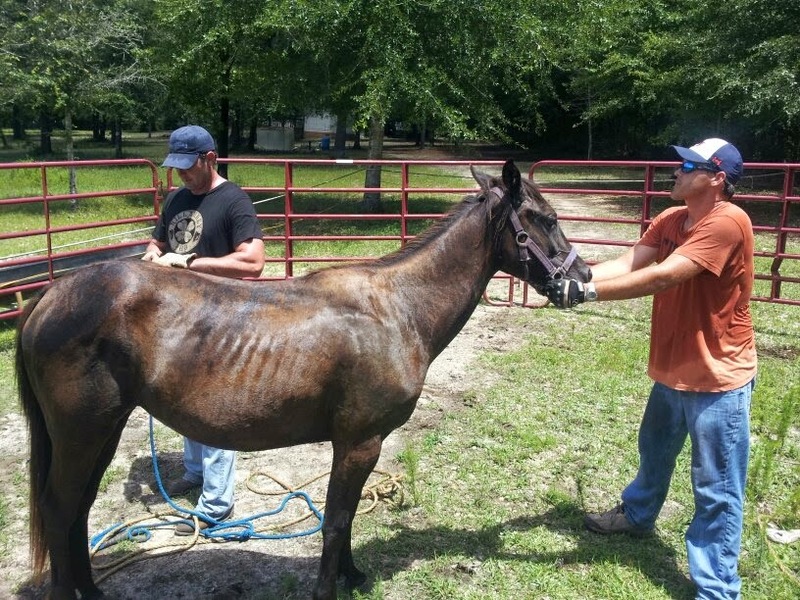 When they heard of a wild, abandoned horse on a large property outside of the busy city of Mobile, they decided to help. The story of the horse unfortunately has a lot to do with the economic downturn from last decade. A family built a beautiful mansion in the woods outside Mobile. It’s removed from the city and sits on many acres. The family, however, couldn’t afford the house and were forced to give it up to foreclosure. Instead of finding their horses loving and caring homes, they left them to roam wild on the land that now belonged to the bank. It’s rumored that one of the horses died because by the time my brother- and sister-in-law got wind of it, there was only one horse on the property. The upside to this tragic story is that the bank was concerned for the remaining horse’s welfare, so much so that they offered it free of charge to whoever could catch it. Several people tried and failed. It seemed that the abandoned filly was a bit feisty. 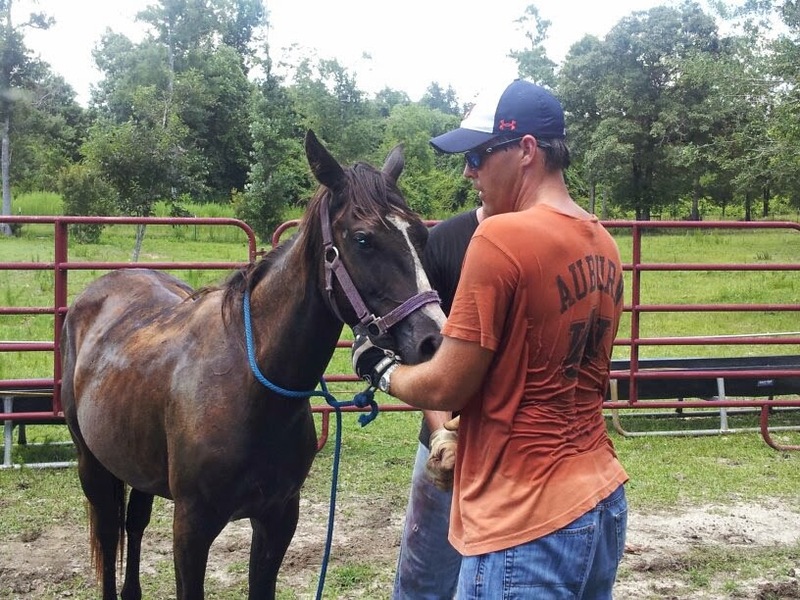 One Saturday, my brother- and sister-in-law traveled with a horse trailer across the bay to see if they could rescue the poor animal. They spent the better part of the day trying but couldn’t quite get the horse corralled. That night my brother-in-law called my husband, asking for his help. My husband agreed and the next day I tagged along for the ride. When we pulled through the gate onto the property, we spotted the horse lingering around the house. She shied at our approach even when my sister-in-law got out of the truck and tried walking to her with a bucket of feed. We parked the truck and horse trailer so that it would be ready if and when we needed it. I was five months pregnant at the time so I sat with my in-law’s youngest child from a safe distance on the porch. Together, we watched as the horse ran into the woods and the others did their best to catch her. It was a hot day, as most are on the Gulf Coast in July. Thankfully, the bank had left the back door to the house open so we could take advantage of the air conditioning and restrooms if we needed to. My niece and I watched as the horse ran from the woods and into the fenced-in pasture where it was once stabled. The others hurried to build a corral with portable fencing we had brought in the truck at the entrance to the pasture. It took them less than an hour after building the corral for them to corner her inside. 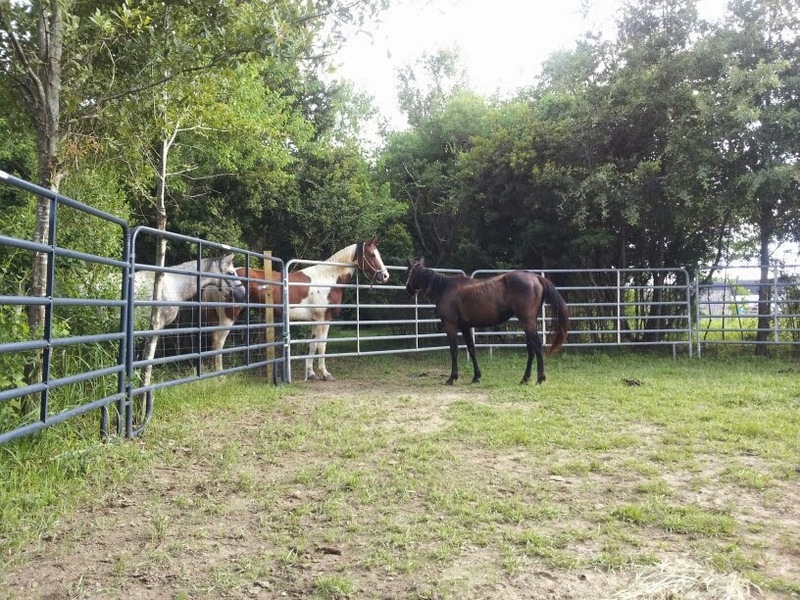 The four of them were already exhausted from running across the large property, but now that they had the horse in the corral they were so close to their goal of getting her safely into the horse trailer that they couldn’t stop. It was now clear to everyone that the horse hadn’t had any human contact for some time. Her diet was poor and she was dirty. The fact that she was small took everyone by surprise. My sister-in-law managed to get a look at her teeth when the horse took a treat from her hand. They were tiny, meaning she wasn’t more than two years old. Still, she didn’t make it easy for my husband and his brother to get her into the horse trailer. By the time they finally did so, their clothes were soaked clean through and everyone was in desperate need of some cold beverages. The ride back to our side of the bay was a long one, but we made it safely out of Mobile and soon brought the horse to her new home. She shied away from the other horses at first, but by the time my husband and I visited a few weeks later, she seemed to be warming up to her new abode, the family, and their animals. She had started gaining weight and seemed to love the shade of the front pasture. While we were there visiting, she even went so far as to let me pet her face. When the veterinarian came out to inspect her shortly after her arrival, he informed my in-laws that she was barely a year old. They decided to name her Bella and cared for her for several years before giving her to another caring family. I love a good redemption story, especially those that involve animals. Further, I love those who rescue animals in need without question. It’s why including the story about hero Gerald Leighton and the stray dog in my second Harlequin Superromance novel, Married One Night, was so important to me. This was my way of recognizing everyday heroes like my in-laws and my husband who don’t hesitate to take action when an animal needs help or a loving home. This month I’m celebrating the book birthday of my Harlequin Superromance debut, A Place With Briar! Happy birthday to my hero and heroine, Cole & Briar! Here’s a little after-HEA slice of life from their wedding day to celebrate…. Reading through the post I kept thinking of the story BLACK BEAUTY. I loved this story. Thank you so much for sharing it. I can't believe those horses were just abandoned like that. Thank goodness for people like you and your family who take action to help our fellow creatures! Connect with SuperAuthors on Goodreads too! Question of the Month: Do You Karaoke?